bright lava effects, said Universal when the new Orlando’s coming attraction was revealed last week. Unniversal announced new details about its coming Volcano Bay water park. A wristband will alert guests when it’s time to get to the next ride. The new magnetic technology that will be introduced by Universal is called Tapu Tapu. All guests will receive a Tapu Tapu wristband when they enter the park. The lines for the attractions will become virtually nonexistent. The Tapu Tapu wristband will allow visitors to “virtually wait in line” while playing in other areas of the theme park. Tapu Tapu will vibrate 15 minutes before it is time to board the next ride. Volcano Bay’s major slides including Krakatau Aqua Coaster will use the new wristbands. 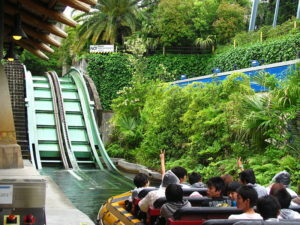 The band would be able to trigger special effects within the park like firing of water cannons at other guests on the Kopiko Wai Winding River, water spurts at Toi Tiki Reef and lighting up images in the volcano’s caves. The water park is scheduled to open next summer. Volcano Bay will include four Pacific island-themed areas: the Volcano, Rainforest Village, Wave Village and River Village. The crown of the water park will be the Krakatau Aqua Coaster.The ride will include canoes traveling through the peaks and valleys of the 200-foot volcano, called Krakatau.